Red clover is a member of the legume family and is often used on organic farms as a cover crop to add large amounts of nitrogen to the soil. As a medicinal plant, it is used as an alterative (“blood purifier”) to help treat acute and chronic skin conditions including acne, eczema and psoriasis. Red clover contains active phytoestrogens that bind with endogenous estrogen receptors. It can be used as a tonic for menopausal women to help reduce the frequency and intensity of hot flashes. Red clover also helps to regulate the menstrual cycle and to prevent and treat vaginal dryness and osteoporosis. Red clover contains coumarins which have blood thinning properties so it is not to be used with anti-coagulant medicines. 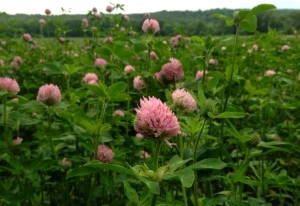 Red clover is sweet with cooling and moistening qualities. It is vitamin and mineral rich and as such, it can be used as a nourishing tonic and soothing to dry, irritable tissues. Red clover has an affinity for the glands of the body and can help ease salivary gland congestion or other swollen glands. The aerial parts of the plant are used and dried for infusion or extracted fresh in alcohol. To make an infusion, pour 1 cup of boiling water over 1 to 3 teaspoons of dried herb and infuse for 10 to 15 minutes. Drink three times a day. Gently crush 1 cup of fresh red clover blossoms. Combine the blossoms with 1/2 cup honey and 3/8 cup water in a pot. Over low heat, bring to boiling and simmer for 15 minutes. Allow to cool then strain and bottle. Store in the refrigerator. This syrup is soothing for coughs and sore throats and makes a pleasant flavoring for tea. Cautions/Contraindications: Caution in high doses during pregnancy with history of miscarriage.